Hello everyone. Spring is suppose to start very soon, but watching through the window that probably won't happen any time soon. It's been snowing like crazy again and thankfully it'll stop in the evening - so let's hope this weather forecast actually comes true. 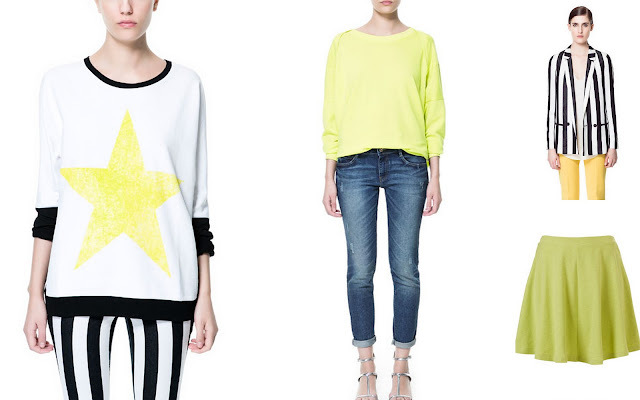 Anyway staying in the whole spring spirit I decided to post about new trends for spring 2013: stripes and yellow/lime colour. If you have gone shopping lately you probably saw this kind of trends on the shelves of ZARA, Topshop, Asos etc. For me this trends don't suit me at all, because I hate yellow and I really don't see myself wearing it. I'll probably make some kind of deal with myself and go with the lime colour :) And about the stripes - at first I hated them, but now (it's just like military trend all over again) I love them. But you have to be really careful with styling them because they can easily make you bigger than you actually are. So this is it for today. Hope you enjoyed this post and let me know what are your favourite trend for the upcoming season. Stripes and yellow ..must have!! I follow you.... Thans to be passed to me! Follow me now!?! Lovely blog!Now I'm following you..if you want follw me too! I really like bright colours! Could you follow me back via bloglovin' too? i'd love sth striped in black and white for this spring! I can't wait for spring, and these outfits are awesome!! I follow your blog. If you like mine you can follow it too. Hey great post, I really like the striped shirt. I've seen a few of them in H&M and really want to get one! Love the new Zara collection!!! Thanks you so much for your comment on my blog! You have a very nice blog and I'm following you now :) I'll be really glad if you follow me too :) Thanks!! I'm also a fan of the polka dot trend! As well as the Jacquard print!